I love the photo of the grass--one of my favorite photographic subjects! Lovely images and haiku! The sky is beautiful. I am sure the children love that slide. Thanks for sharing, have a happy week! "To live life well is to be creative" I'll write this in my journal tonight! Lovely photos my friend! Love your photos, especially the collage and it is so well accompanied with the insightful quote and beautiful haiku and I always love seeing your sweet little dog. He is so special! Beautiful photographs! Love your sweet PUP!!! I too just adore the shot of the swaying grasses. The sunset view also caught my eye. Such great images. Love the blue in the mosaic - such a pop of colour in a winter world. I love that little dog of yours! Yes some bamboo is overpowering!! I love the sky shot today!! Ohhh that mellow yellow! Stuff of dreams...beautiful post. And I like Coco Chanel's take on adornment. It can absolutely reflect one's state of being. Very nice haiku. I love the pictures of the grass! Beautiful! That bright blue slide certainly does get your attention. Wonderful pics. Have a fabulous week! Love the energy in that photo of wind-blown grasses! So beautiful! 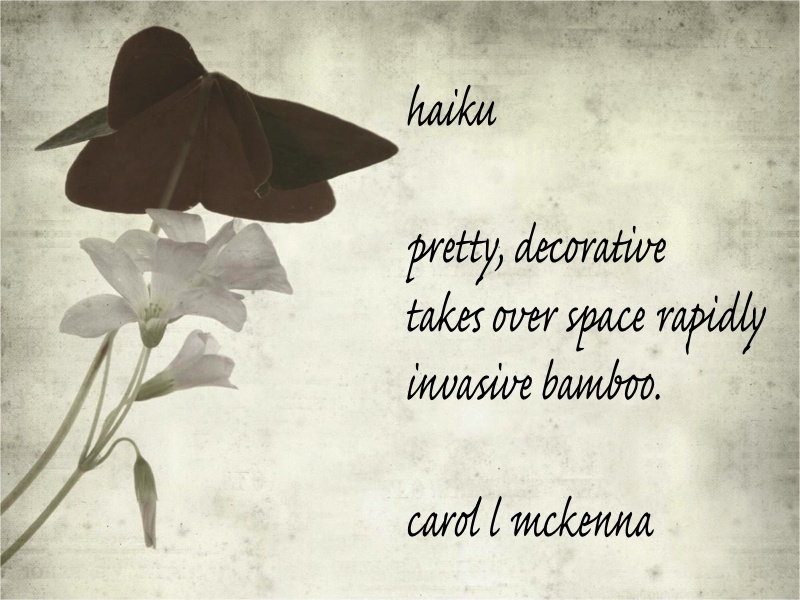 And your haiku captures the "light and dark" of bamboo so well! Lovely photos. Have a fabulous week! The dried grass and sunset are remarkable. Excellent work! So true, Carol your words...life lived with lasting enthusiasm is as creative and artistic as any great work! Beautiful bamboo as an invasion of space--oh, my! I love the brilliant blue in the slide. yes, grow to be pretty tall trees ^^ i love the mandarin orange skies! Lovely Haiku. Beautiful pictures too. Thanks for sharing the links to creative bloggers. these are beautiful! i love the swaying grasses--i could almost feel the breezes. and the sunset, amazing cloud formations. What a wonderful post Carol (and ArtMuseDog) nice photo's. And that haiku on bamboo is awesome and so true ... bamboo when it has rooted deep in the garden you will not lose it. It's a strong plant and so flexible ... I love the sweet sound of bamboo rustling in the wind. Thank you for sharing this gem with us. Material things can be like bamboo. Taking over your life and you feel overwhelmed. It is most difficult to eradicate too once it has been there for so long. I've never met a bamboo stalk I didn't like! I would like to be inspired by sailing at the creative harbor. I love your Haiku. How true it is. I need my space to grow and create. Your sky pictures are beautiful. Love the sunset and the grasses. Lovely photos. Beautiful photo's! 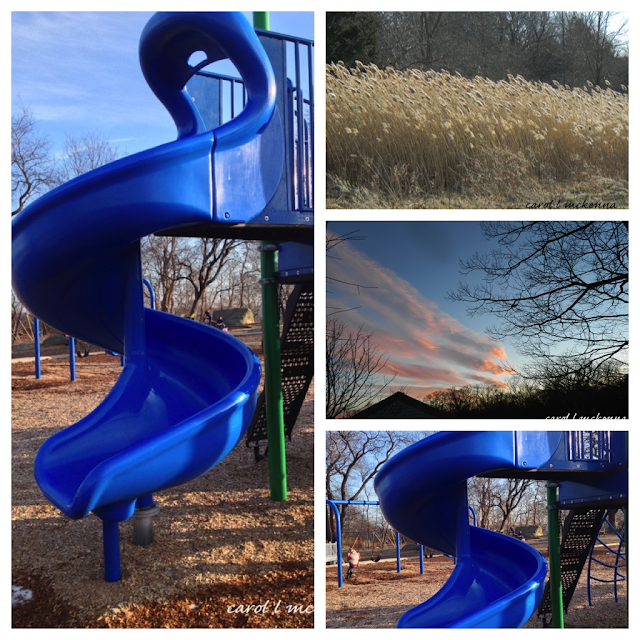 I especially love the tall grass photo! oh wow!!! amazing photos!! 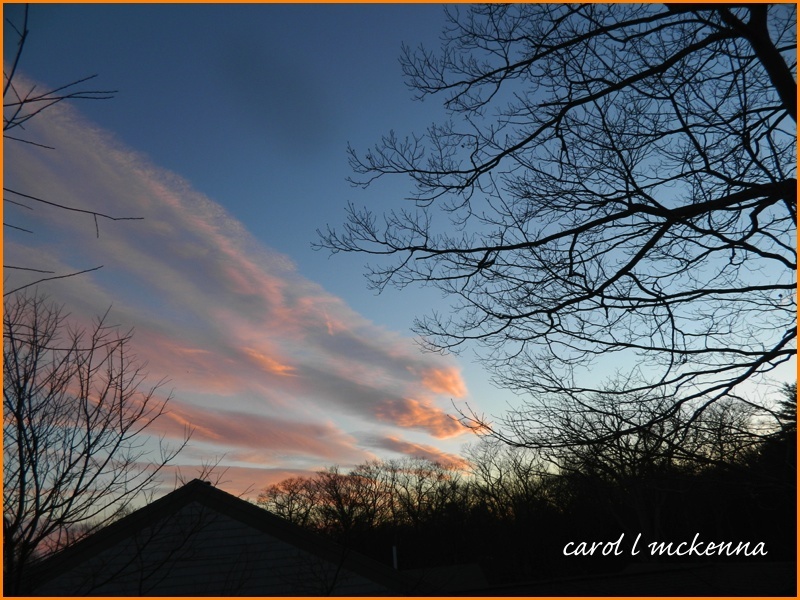 !love that sky Carol!!! 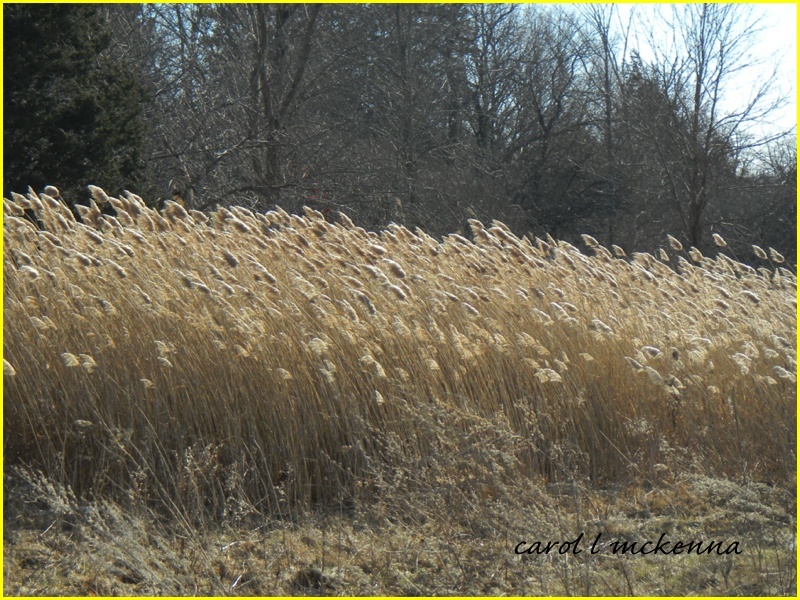 How I love sweeping tall blush colored grasses waving in the wind! Very sweet post and beautiful photos. The haiku is wonderful, too! dear and beautiful Carol, I like your photos. They always make me feel calm and relaxed. I love your haikus as well. Thank you for sharing your creative thoughts and ideas. Have a beautiful week. Wonderful, had never thought of bamboo as a weed. So much to comment on today. I'm loving the blue curve of the slide, the gentle bend of the grass, and the oh so true observation of the dominance of bamboo. Especially lovely post today, Carol. I am happy to get to know Cape Ann a little better, in this post and the one above. I would only have ever thought of it as a coastal village, not the country part of it. Lovely village. Your photos are gorgeous - especially the skies. Love your haiku as ell. Your photography is captivating and your puppy is adorable. Thank you for your nice comments, it's quite an honor.